The Visiona exhibitions, which ran from the end of the 60s until the 70s, are still considered visionary in terms of creative use of space and radical visions of the future of design in the 20th century. Titled "Visiona 2 - Revisiting the Future", the Vitra Design Museum in Weil am Rhein, Germany, was exhibiting Verner Panton's 1970s' radical visions for the future from 7 February to 1 June 2014. In 1968, the chemistry company Bayer AG hired an excursion ship right next to and on the occasion of the Cologne Furniture Fair for the first time to promote the technical possibilities and practical use of its new synthetic fibres through a home textiles collection. However, in order to do justice to the ascetic and artistic aspirations of the time and generate end-user appeal, Bayer also employed popular contemporary designers to create an interior design for the ship. The first exhibition (Visiona 0), which was organised in 1968 by the Danish architect and designer Verner Panton, turned into a raving success. 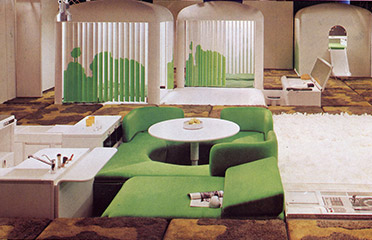 Although Panton completely upturned the original concept for the exhibition by making the Bayer products no more than part of the background, the net effect of this first Visiona exhibition vastly exceeded all of the existing parameters of advertising and created an Avant Garde space that broke existing home design traditions. 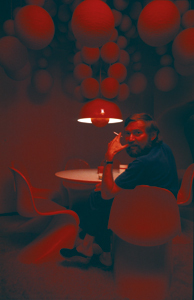 In doing so, Verner Panton integrated his trend-setting designs into the rooms, such as the Fun, Flowerpot, Topan or VP-Globe lamps, as well as the legendary Panton Chair. Although it took a lot of work to make plastic furniture attractive to end users at that time, his cantilevered plastic chair is now a renowned design icon that is sold a millionfold and exhibited in renowned museums all over the world. The enormous success of the first Visiona exhibition paved the way for the next one the following year. Bayer successfully hired Joe Colombo, who caused an uproar with his designs of complex, multifunctional furniture modules, for Visiona 1 in 1969. Ceiling-fitted televisions, swivel walls with integrated mini-bars – the Italian designer Joe Colombo presented designs that might as well have come from the James Bond films of his time. The interior design ideas showcased by Joe Colombo at the Visiona 1 consisted of futuristic Space Age elements that were way ahead of their time and were revisited and merged in Colombo's “Total Furnishing Unit” from 1971. The third and probably most famous exhibition was the Visiona 2 in 1970. That year, Verner Panton was asked again to design the Rhine ship “Loreley”. His installation “Fantasy Landscape” comprised a creative firework of bright colours and organic shapes, the photographs of which continue to encapsulate the spirit and progressiveness of the entire Visiona exhibition series. 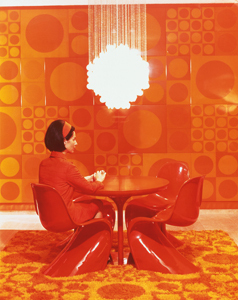 Less related to Joe Colombo's space age design and more reminiscent of the interior world of humans, Verner Panton created a “living cave” that ignored all traditional architecture concepts and could be considered the pinnacle of Panton’s creative visions. In the cave, floors, walls, ceilings and recesses are seemingly moulded from one piece and infused with opaque blue and red tones. The cave's lighting was integral to the design and supported with various sounds and scents in the different rooms. This is how these psychedelic room designs made history and became some of the most important installations of the second half of the 20th century, creating a media hype at that time. Many of the furniture pieces, lamps, wall decorations and textiles created by Panton for his “cave” went on to be mass-produced in slightly altered form later on and continue so to this day, including the Amoebe, the Living Tower and the Spiral lamp. Visiona 2 with Panton’s visionary room design was difficult to outdo, which is why Visiona 3 in 1971 by Olivier Mourgue was unable to generate the same level of attraction it had before. However, its architecture had a lot of potential. The French Olivier Mourgue was especially popular because of his futuristic furniture designs, such as the “Djinn Chair” he designed for Airborne International – becoming famous as an armchair and key piece of furniture in Stanley Kubrik’s movie “2001: A Space Odyssey”. At the Visiona 3, Mourgue presented a nature-inspired interior design concept with geological and grass-inspired flooring and carpet designs. He worked on two levels and concealed household technology, such as electric devices, under the floor, while featuring inviting, relaxing and organically shaped lounging and sitting areas at the top level. At the core, his vision was inspired by the concept of harmony between people and people in harmony with nature. Visiona 4 took place in Frankfurt for the first time in 1974, on the occasion of the home and textiles exhibition. This is where Visiona returned to the present in the actual sense of the word. Not as it did at end of the 60s with its the “Space Age” look, but with contemporary flair, as Bayer presented numerous textiles, floor covering and material finishes from its current collection under the artistic direction of the American fabrics designer Jack Lenor Larsen. Visiona 5, designed by architect Paoplo Nestler and only featuring few visionary furniture designs, followed in 1980. An exhibition featuring exceedingly few interior furnishing elements, it finally became what it was meant to be all along: a public event for marketing Bayers' latest textile innovations. However, the first Visiona exhibitions remain unique, and especially Visiona 2 will be remembered for a long time. They set trends both for today’s and the future of interior design and continue to define the image of the Space Age-like and psychedelic designs of the past. Joe Colombo Cesare (named Joe) Colombo was born in Milan on July 30th in 1930. For a couple of years, the autodidact attended the Academy Brera and the Faculty for Architecture at the Politecnico in Milan.